This 1500 square feet european style 3 bedroom, 2 bath with 2 garage stalls falls in the 1000-2000 square feet range. It also combines elements from the french country style. 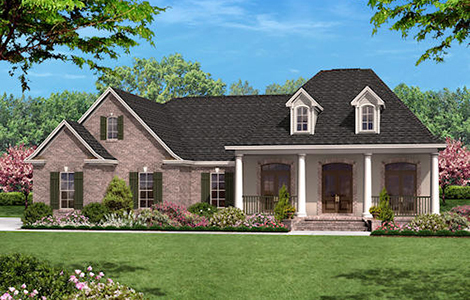 The floor plan features walk-in closet, great room/living room, covered rear porch, volume/vaulted ceiling, peninsula/eating bar, covered front porch, storage area, split bedrooms, side-entry garage, suited for corner lot, open floor plan.